"So out of touch. No phone & limited access. Traveling Spain in the back of van. " - What I wrote on Facebook this day 7 years ago. 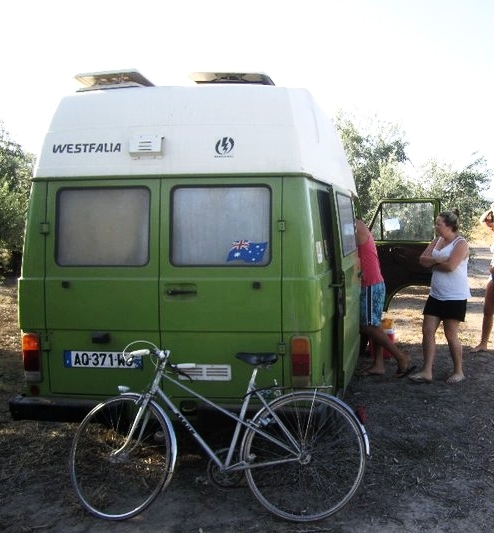 I was living in Portugal with some girlfriends when a mate said he was coming through in a giant green van and asked if we wanted to road trip it!? So, of course we quit our jobs and off we went. 6 of us traveling the coast enjoying reggae festivals, La Tomatina, random camping spots, and new friends from around the world. We had no idea what we were going to do once we reached Barcelona nor did we care. It was true freedom, it was adventure, it was living! One of the things I LOVE and believe is so powerful about travel is that when we're 'out there' the magic of spontaneity seems to come around more often, chance and opportunities seem to be more accessible, or perhaps it's that we are more open to them? Stepping outside of our normal societies, comfort zones and routines brings about a different energy, perspective and willingness to take risks. It gives us the confidence to shift and grow. I believe it's why we often feel more alive and connected when we are 'on the road'. Well, I know that to be true for me. Do you feel stuck, stagnant and craving some inspiration? Then I urge you to go on an adventure. Somewhere new. Where you don't know anyone, where you don't speak the language or recognise the food, where you don't know your way & you don't have any plans. Just go for the sake of going and let the journey unfold. Step out of your comfort zone and into your life. One of the best and fastest ways to create change is to shake things up and throw ourselves into the unknown. The power that travel and adventure holds for deep and lasting transformation within ourselves and our lives is endless. If you are willing to go into your travels with your heart, eyes and mind open then the lessons, experiences and people who are just waiting to enter your life, have space to move in. That road trip reminded me that some of your happiest moments, connections and memories are often unplanned adventures waiting just around the corner when you least expect it.